I have collected vintage hankies for many, many years and will be listing many lots of one dozen hankies. These hanky lots have been laundered, lightly starched and ironed (by me) and are from a smoke free environment. I am listing such a large volume of hankies that I am only posting 1 photo showing all 12 hankies for each lot. 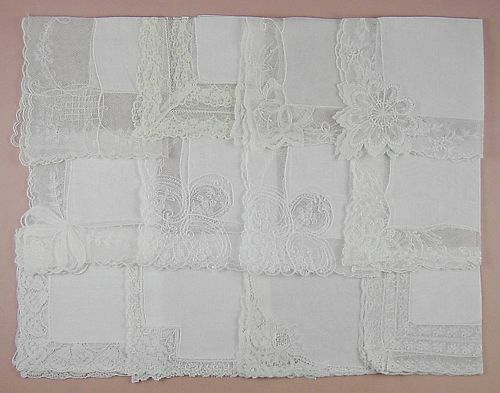 I will be listing several lots of white hankies with many of these hankies being suitable for use as wedding hankies. There are different sizes within each listing. This group has white hankies with each having beautiful edgings. Please view the photos to see what each hanky actually looks like for that particular listing and if you have any questions, please contact me.